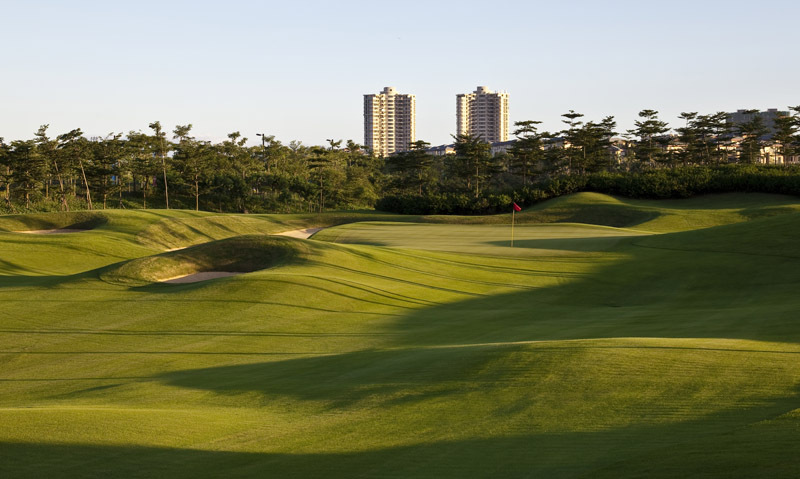 Lingshui, China – Schmidt-Curley Design recently unveiled its newest golf course design project in China, the B Course at Clearwater Bay Golf Club in Lingshui. It is Schmidt-Curley’s second design at Clearwater Bay for the Agile Group, one of China’s leading property developers. The par-72, 7,035-yard layout is Schmidt-Curley’s 13th course to debut on Hainan Island, epicenter of the Chinese golf course construction boom, since 2009. Set on terrain dotted by picturesque lakes and groves of stately coconut palms, the B Course features a variety of bunker styles. They include steep, grass-faced, sandy waste areas and a number of penal pot bunkers. Water also comes into play on nine holes. Two short par fours are highlights. Players who challenge a bunker and lake down the right side of the 380-yard third hole will be rewarded with a short pitch to the green. Those who select a safer line off the tee will be left with an exacting approach, especially when the pin is back right. The 15th Hole is a 337-yard par four with an exceptionally generous landing area. The putting surface, however, is perched three meters above the fairway and protected by deep bunkers and grass hollows. 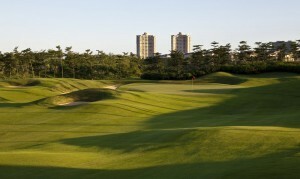 The B Course ideally complements Clearwater Bay’s par-72, 7,333-yard A Course. Opened in 2009, it is characterized by high-flashed bunkers and several windswept, seaside holes. Architect of record for all 10 golf courses at the new Mission Hills Hainan — host of this fall’s Omega Mission Hills World Cup — Schmidt-Curley has two fully-staffed Asian offices (Haikou and Kunming, China) in addition to its Scottsdale, Ariz-based U.S. headquarters.